For your added protection the premium for trip insurance is added to your total amount due when your rental agreement is sent to you. You are under no obligation to accept this coverage. Once a rental agreement is signed, a refund will not be given unless the property is re-rented for the contracted dates. Trip Insurance is an inexpensive option to give you peace of mind. Convenience, Security and Assistance. All travel insurance companies-and their coverage, benefits and customer service-are not alike. We take pride in exceeding our customers’ expectations by offering value-driven travel insurance and emergency assistance services backed by excellent customer service, claims handling, and the financial strength of our underwriters. 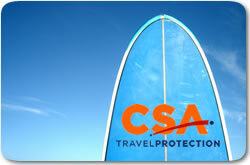 In 2007 CSA insured more than 1.3 million travelers. Your vacation is an investment worth protecting with a travel insurance plan that looks out for you. We provide excellent customer service and claims handling with a personal touch. We care, we’re honest and we’re there when you need us. All calls are answered by a thoroughly trained professional and not an automated system. CSA offers coverage for pre-existing medical conditions on its WebDirect Luxe plan. CSA’s unique and valuable benefit provides this coverage if the plan is purchased at any time prior to or within 24 hours of final trip payment, a distinctive offering in this industry. CSA’s Supplier Bankruptcy and Default coverage protects you against the bankruptcy of your travel supplier, provided the financial default occurs more than fourteen days after your purchase of the policy. To qualify, you must first purchase a qualified CSA Travel Protection travel insurance and assistance plan (WebDirect Luxe) prior to or within 24 hours of making your final payment. Some policies only cover you only while on board ship or just on your vacation. Unfortunate events can happen en route to and after your trip. That’s why CSA travel insurance plans cover you from the day after you buy your policy right up until you return home. In addition, CSA provides identity theft protection with recovery assistance services that lasts for a full six months beginning on trip departure date. We know that interrupting your trip is often more expensive than its original cost. If a trip is interrupted, many competitors’ policies only cover up to the original cost and credit cards often won’t provide coverage at all. CSA goes even further: We provide a 150% Trip Interruption benefit that helps pay for you to get back home. This travel insurance benefit provides primary coverage if the car you rented on your trip is damaged due to collision, fire, flood, theft, vandalism, windstorm or hail. Because CSA provides primary coverage, in most instances you never need to inform your car insurance agency if a problem occurs. Also, because CSA pays first on these claims, it eliminates the need to purchase additional collision waivers from the rental car companies. FOR MORE INFORMATION ABOUT TRIP INSURANCE PLEASE CONTACT A DEER RIDGE REPRESENTATIVE.